This 10' x 10' Super Lightweight Commercial Aluminum Popup Canopy offers a great combination of convenience and privacy thanks to its innovative rip-stop polyethylene sidewall panels. 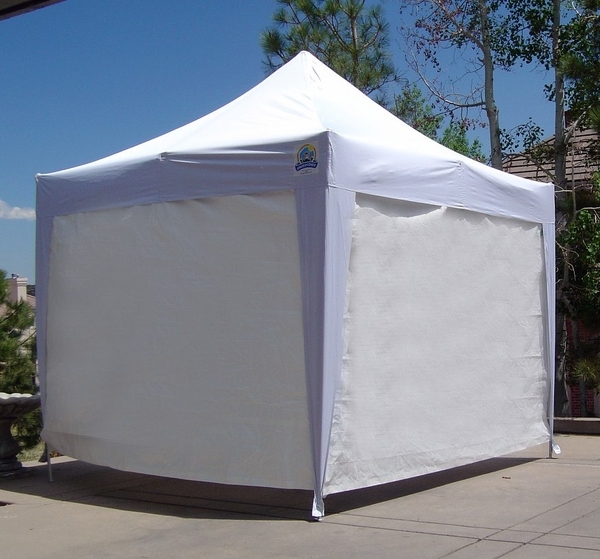 One person can assemble the canopy and attach its sidewalls in seconds, while the 300 denier polyester tarp is 99% percent effective in blocking the sun's dangerous UV rays. The aluminum construction in the legs means lightweight stability that's still easy to transport. 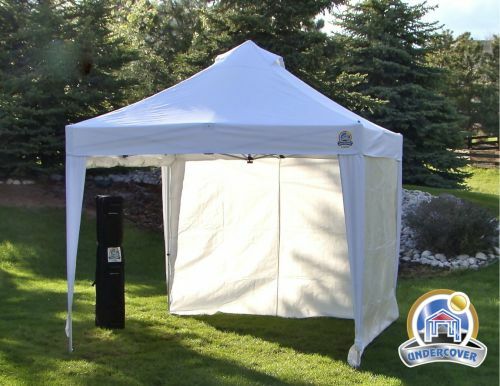 Get the most from your canopy with Undercover, the leader in portable canopy products. * Please Note: Legs covers that are shown are not included with this Canopy. How can I get leg covers for this? Where can I find a 10 x 10 tent in a khaki, tan, or beige color? Any of the Caravan brand canopies can be ordered with a beige top. Just use the Narrow Selection By feature of the left side of the page to select Caravan. What is the height at the entrance? There is a 7 foot clearance from the bottom of the valance to the ground when it is on the highest setting. After watching the video, I wanted to clarify the following: Is the top always attached? Or should I put the top on the frame first and then pop it up? The canopy top is a separate item that must be attached prior to setting up the tent. However, the top may be left in position when folding down the tent for storage. The top will have greater longevity if it is removed each time, but this is not always practical. Is this tent waterproof? 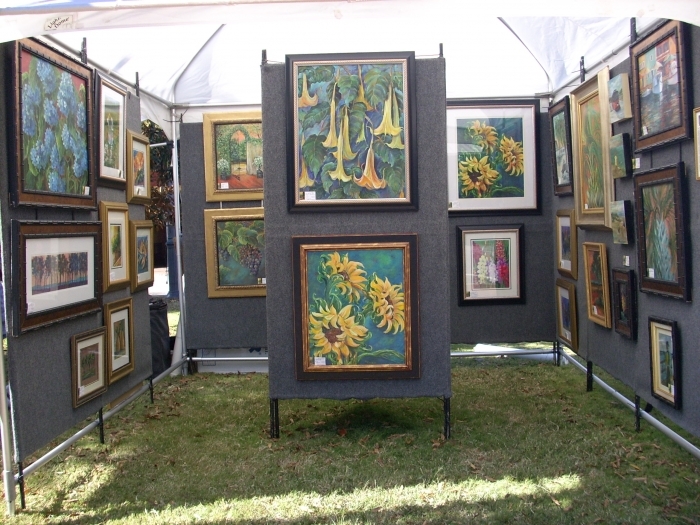 We do outdoor art shows and we're looking for a light and easy-to-set-up tent for quick shows. Unfortunately, no, this canopy is not waterproof, only water resistant. The only 100% waterproof 10x10 pop-up canopy we offer is the Vitabri V3 10 x 10 Aluminum Pop Up Canopy. Are these tents wind resistant? These tents are not wind rated. None of the pop-ups are. Why is this one more expensive than the UCC-3R10WV? Which one is sturdier and easier for one person to handle? What type of weights are included and what is a better option to add just in case? UC-3R10WV is a commercial strength shelter that can hold up better to the stresses of commercial usage. The frame is a hybrid with steel truss bars and aluminum 1 1/4" legs. Frame weight 45 LBS. UC-3P10WV is a light weight vending unit. It's made for easy transportation setup and takedown. The frame has aluminum truss bars and 1" aluminum legs. Frame weight 28 LBS. Weights are available separately on the accessories tab. Poorly designed. All the weight on the roof is on one small support that is about 2+ in diameter at the peak. In a rain or snow this would be a real problem. We had it up for a day in a 20 to 30mph wind for several hours and nearly lost it. This is not a canopy that you set up and leave in your backyard or camp for a day or two and expect to see it still up in a storm.. The bases are plastic which over time can give out and be detached from the legs. ProsLooks good. Nice carrying bag. ConsStructure poorly deisnged. Cannot leave it unattended in the slightest storm. Instructions are poor. While it's easier for two people to set up because of the size, it is possible to manage on your own too. I thought it would be much heavier to lift collapsed or to roll in its case, but I was able to do both with no problem. (5'6" female) With help, it sets up very quickly once we figured it out. 2nd and 3rd setup was much quicker so I recommend you practice first if you've never handled a canopy like this. ProsThe quality is really nice as far as construction and appearance. Our canopy definitely stood out among flimsier types at a festival. The placement of loops for signs or posters help a lot. The walls attach easily but for this event, we only used one. ConsThe instructions could be more thorough but common sense helped us through the first setup ok. My main fabric banner needs a rod run through (like a shower curtain)to hang properly, so it would be nice to have a bar type set up to hang silky banners to prevent sagging. UnderCover Canopy is a winner! Purchased the canopy this summer looking to use outdoor in late September. I am 75 yrs old, 5 foot woman and was able to set up the tent using 40 lb. sand bags at each corner by myself and also took it down by myself. The side walls were a bit more of a struggle to set up. I appreciate the vent possibilities at the top. The frame work of the tent seems very strong although so light weight. ProsThe tent is light weight and with the wheeled bag is no problem to take to the site. The banana style of the bag is very convenient as I watch others trying to pull their tent bag down over the tent. The day of the show winds were predicted at 5 to 15 mph but we had much stronger gusts. I ended up hanging onto a front post to hold the tent in place but the tent did not go down. Three tents that day went down and were lost. ConsThe directions to attach the side walls are lacking. They leave one pondering as to what side even is up or in or out. Nice quality, went up easy. I will be attending my first outdoor craft show and spent a lot of time trying to find the right tent that had the look I wanted. After checking around, online, this is the one I like the best for the money. We put it up and it looks great! The walls are tarp-like but still looks very neat and clean. Everything went together smoothly. I would recommend this tent. I am a happy customer! Thank you!! ProsVery nice quality, went up easy. I like the peaked top. It is definitely bigger and heavier than the other canopies I've had before, but much sturdier, and the bag much sturdier, too. The only thing I've found a little difficult was pulling the loaded bag, since it's so big, as it drags a little on the bottom above the wheels. It's actually almost easier to push it. But that's minor, and not a reason to not get this tent! I am SO pleased with it, and so glad I got it! I used this canopy this summer for an art fair. It is soooooo easy to put up and take down. I am a woman and do these shows myself so weight and ease of use are important. It''s sturdy enough as long as there is no heavy weather in the forecast. I would buy this all over again. A wonderful tent. It is as easy to put up as the video showed on the website. It is excellent quality canvas and the carrying case is top quality. Everything you need comes with this package. I have added heavier stakes for tie down but that was not a big deal. The stakes that come with it are adequate. The best feature is the locking leg mechanism. It is not one of those button locks that pinches your fingers. They are red in color so they are easy to find. It also has a tension screw so you can make the roof more tight so water does not pool on top. The shipping was very quick and free. I will definitely recommend this tent and use your company again. ProsGreat ease in setting up. Top quality materials. Great carrying case. ConsCould have heavier tie down stakes. I do craft shows and while we have only used it a couple of times, thus far we are really pleased. It's easier to put up than any other we have had and love the fact that the top can be stored with the tent in the bag. ProsEasy to put up and take down. Top stays on the frame and is stored in the bag. ConsSmall leg plates for anchoring. While spikes for anchoring came with the tent and I have sand bags still feel I need something more to secure the frame to the ground. The canopy goes up and down easy with one person, but you really need 2 the first time to help with getting the canopy in place. Two people helps with subsequent risings and flowerings as one can hold the legs (especially if it's a little windy) while the other puts them up/down. It goes easily into the bag with the canopy on and there's plenty of room to allow for the canopy in the bag without being sloppy so the canopy doesn't wobble in the bag. Tip: Don't lay the bag flat when placing the canopy in the bag or taking it out. Stand it up and pull the canopy out from the top. You won't get the canopy top dirty from it laying on the ground and it's much easier to handle this way. I can't comment on the sidewalls much as I only had one of them up to block out the sun, but getting them folded is much easier with 2 people and getting them stuffed back into the bag can be a challenge. ProsGoes up and down easily; Canopy doesn't have to be removed each time; Manageable by one person. ConsSpotty documentation included. You have to watch the video on this site to understand the best way to put the canopy up. 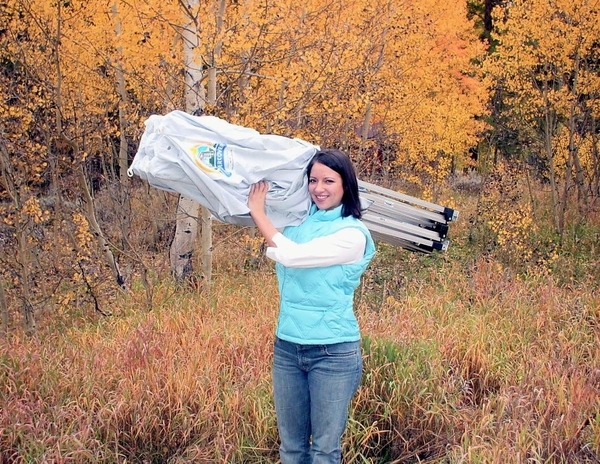 Last year i borrowed a canopy tent for the summer trade shows. This year i decided to purchase my own. I found this website and was impressed with selection and price. I called to ask questions and the staff was very helpful - expanding my confidence in the company. I purchased this one and it was delivered promptly. Unfortunately, there were no instructions included on how to put it up - frustrating for a new canopy owner. But I reviewed the video online and figured it out and it was simple once you do it once or twice. The first vendor fair was a bad weather day - rained on and off all day. The side walls were invaluable! Kept everything dry. ProsEasy up and down (once you've done it) Very portable with rollers on the bag. Two height positions on the legs. ConsInstructions were lacking. I called the company and they said they would email the directions but they never did. Yesterday I received my order quite swiftly, thank you. I had bought one of your commercial UC-3 10X10 canopies a few years ago and have been very impressed with it's design. A very good investment, compared to the previous cheaper canopies I had used before, which made me want to be a return client. I had not even realized this was designed to be able replace the cross struts until I finally went to your web site for a replacement canopy, after a wind storm mishap at a job site that severely damaged 2 cross members and tore the cover up. Now I am even more impressed with your companies ethics. A subject quite dear to me in the way I run my business as well, but sadly lacking in most industry. Thanks for making such a well thought out product. I have been doing art shows for nearly 40 years. I have bought so many canopies from so many companies. I know good and I know bad. This one is GREAT - I used it all of last year and am more than happy. This brand is so far superior to the canopy sold this year in the warehouse that there is no comparison. If you need a quality booth this is the very best for the price."